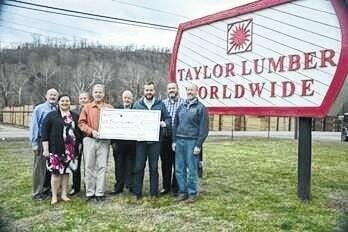 In January, Fluor-BWXT presented a $25,000 grant from the Fluor-BWXT Community Commitment Fund to Taylor Lumber Worldwide on OH-73 in McDermott. The grant was used to help purchase laser scanning equipment that provides faster and more accurate measurements of cut raw wood ready for shipment to Taylor Lumber customers. The addition is part of numerous other improvements to the 100-year-old lumber company, which has grown from 172 to 210 employees in the past year. The 68-acre lumber company supplies dried lumber and dimensional wood products like wood trim and high-quality hardwood flooring made out of white oak, red oak, hickory and walnut to customers in the contiguous 48 states as well as some international customers. Ohio Valley Veneer owner Ed Robbins took over the Taylor Lumber yard in 2013. In addition to growing their workforce under the direction of Robbins Taylor Lumber has added new equipment, including three new saws, warehousing and new finished product lines including engineered flooring to their list of quality commercial and residential offerings. In partnership with the local communities and their economic development directors, Fluor-BWXT supports grant requests from Pike, Ross, Scioto and Jackson counties looking to grow their businesses and add quality jobs to this region. Each year Fluor-BWXT invests more than $500,000 locally through grants and related business support. According to the Joint Economic Development Initiative of Southern Ohio (JEDISO) Fluor-BWXT grants totaling $881,000 have led to $5.5M in matching funds that in turn generated $186M in local investment. The results are more than 830 jobs created with more than 5,000 jobs retained across the region.